To divide many types of retirement accounts in a divorce, federal law requires that special court orders called Qualified Domestic Relations Orders be submitted and approved by the court. This order, referred to as a QDRO, provides instructions to a retirement plan administrator on how to divide funds from a retirement account after a divorce becomes final. Obtaining a QDRO is often a necessary and critical step in the divorce process. What types of retirement accounts need a QDRO to be divided? The most common types of retirement accounts that require a QDRO are 401(k)s, 403(b)s, pension plans, and federal retirement plans. The order dividing a federal retirement account is called a Court Order Acceptable for Processing (COAP) and serves the same function as a QDRO. What types of retirement accounts do not need a QDRO to be divided? Traditional IRAs and Roth IRAs do not require a QDRO, which means that these accounts may be divided immediately after a divorce. Who is a participant and an alternate payee in a QDRO? A participant is the spouse who earned the retirement benefits. An alternate payee is the spouse who did not earn the retirement benefits but who was awarded a share of the retirement benefits pursuant to the divorce. 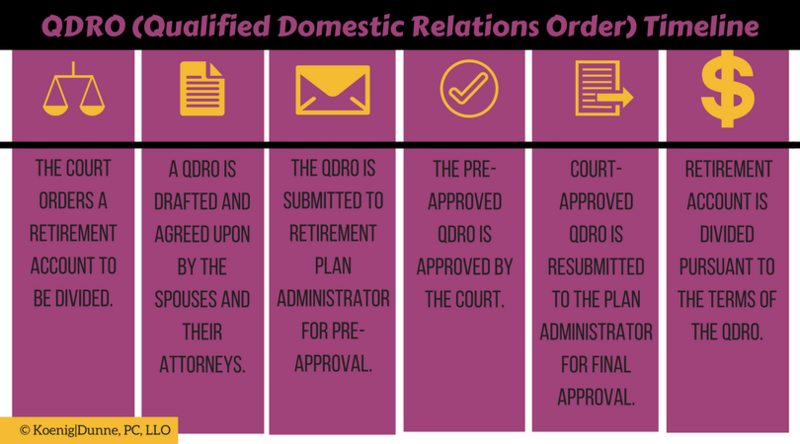 What is the typical process to obtain a QDRO? The court orders a retirement account to be divided. A QDRO is drafted and agreed upon by the spouses and their attorneys. The QDRO is submitted to the retirement plan administrator for pre-approval. The pre-approved QDRO is approved by the court. The court-approved QDRO is resubmitted to the retirement plan administrator for final approval. The retirement plan administrator divides the retirement account pursuant to the terms of the QDRO. How long does the QDRO process take? The length of this process varies depending on the case and the retirement plan administrator. Some QDROs can be finalized within a few months, while others can take a year or longer. This is important because no distribution of retirement benefits can be made until the QDRO process is complete. Your legal team at Koenig|Dunne is here to advise you throughout the QDRO process to protect and properly divide the retirement benefits you are awarded in your divorce.